What's Up Wednesday - Last Few Days To Get Stampin' Up's Christmas Gift To You! Happy Hump Day Everyone! There are 7 days left to take advantage of Stampin' Up's early Christmas gift to you. With the purchase of the Stampin' Up Ornament Keepsakes Stamp Set and the Candlelight Christmas Specialty Designer Series Paper Bundle, you can get the Stampin' Up Festive Paper-Piercing Pack FREE! How is that for an early gift from Santa Claus? Click on my right sidebar to download the flyer. 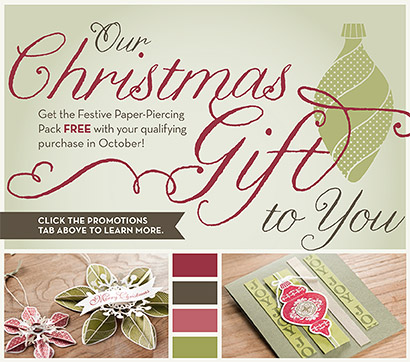 Promotion Details: It's only October, but Stampin' Claus is coming to town! Get a FREE Festive Paper-Piercing Pack when you purchase the Ornament Keepsakes Set and Candlelight Christmas Specialty Designer Series Paper. To take advantage of this promotion, click here.